Despite the gravity of the issue, or maybe because of it, good journalism about immigration, immigrants, systems of exclusion, etc, is often drowned out in favor of bad journalism. Bad journalism tells specific readers what they want to hear, often by omitting or overly simplifying a fact, perspective, or event to support a view-point. I’ve covered immigration stories for the better part of a decade, and I’ve worked hard to be sensitive to the characters involved. I do that for every story I work on, but immigration reporting requires extra vigilance. I compared U.S. and German guest workers; I explored Arizona’s employer sanctions law; I told the story of Germans who lost an E2 business visa and were deported; I visited artists who helped homeless asylum seekers in Switzerland; I visited a village on the Swiss-Italian border coping with and influx of refugees; and on, and on. 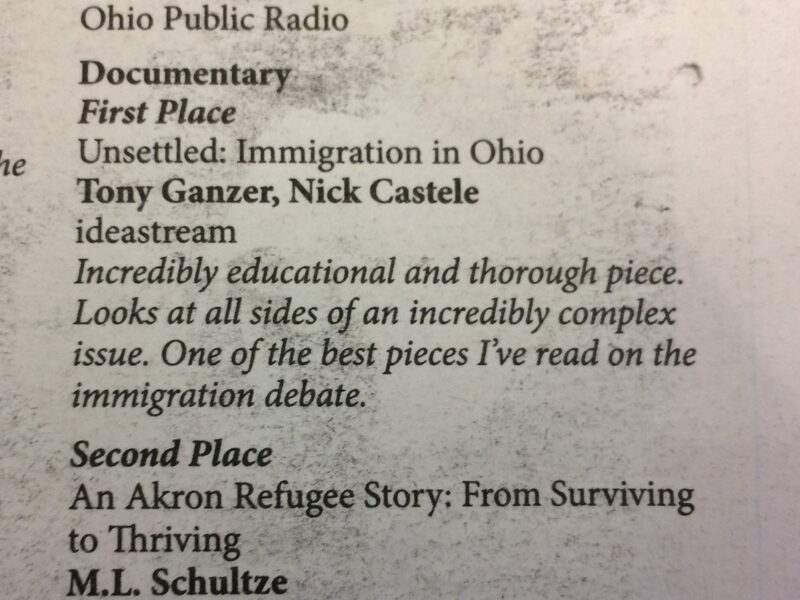 prepared me well for Unsettled: Immigration in Ohio. The multi-part radio series, and radio documentary, aimed to continue what I had started with the Our Land series on community policing, namely to facilitate meaningful, authentic conversations about dangerously serious issues. My colleague Nick Castele and I engaged the immigration debate headlong from Lake County, Ohio, and the town of Painesville. About a quarter of Painesville’s population identifies as Latino or Hispanic, and most come from one region of Mexico, León. We spoke with ‘Dreamers,’ and mothers facing deportation; we spoke with a sheriff and local councilman who is for ‘legal immigrants;’ we spoke with immigration lawyers and academics. We spoke with naturalized citizens. And we spoke to many more people who agreed to share their perspective in a measured way, and respond to opposing views in-kind. As much as I am proud of this work, and I admit my past immigration reporting helped me, this isn’t rocket science. It’s hard because we’re trained to expect a villain, and a hero–even an anti-hero–and clear allies and enemies. Journalists are on deadline. They’re stressed, underpaid, targeted and criticized. But it’s the messy stories that truly reflect reality, and we need that context. We need to hear each other, whether we agree with one another or not, because it’s through dialogue and exchange that we grow as individuals and as a society. I’ve come to believe that we’re not often giving each other the benefit of the doubt anymore. If someone we don’t know well says something that seems off, or holds a belief or political position contrary to our own, there seems to be a tendency toward aggressive confrontation, or writing that person off. Standing at opposite ends of a street, and meeting every two years for an election, is no way to operate a democracy. Journalists and everyone else can embrace the nuance of complicated issues, and try to understand–even a tiny bit–beliefs contrary to their own. Really what I think is necessary, along with embracing nuance, is empathy. Empathy is a powerful tool. Empathizing with someone, even a small bit, does not require any great sacrifice on an individual’s part. It’s just a moment signifying interest in understanding someone else’s journey. It’s through this measured dialogue that issues can evolve. I don’t believe Unsettled changed the world, of course, but I believe it was a great example of what embracing the messiness of reality can look like in journalism. And perhaps over time the messiness may seem a little more manageable.